This category contains 0 products and 20 subcategories. Greater knowledge about family history strengthens and empowers youth by creating self-esteem, resilience and a greater sense of control over their lives. Studying the family's past also strengthens the relationships between living family members by creating a shared experience and core identity that no one else in the world can duplicate. 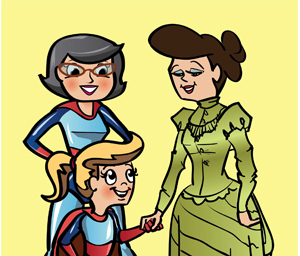 To help families achieve these great benefits, we've produced the Zap The Grandma Gap "My Ancestor Activity Books." These 52 page activity books are designed for 6-14 year-olds, to help create stronger bonds in modern families by encouraging the whole family to learn about their ancestors together. Young people can take the lead to accomplish the activities in this book with their family members. As it is filled out, the activity book becomes a new family keepsake to pass down to future generations.